Killing for science. Killing for fun. What’s the difference? Japan has to stop capturing and killing whales under its whaling program in the Antarctic, called JARPA II, the International Court of Justice has said. In a judgement issued in The Hague in the Netherlands today, the U.N. court has ordered Japan to revoke existing permits to catch whales for scientific purposes and to stop granting such permits in the future. 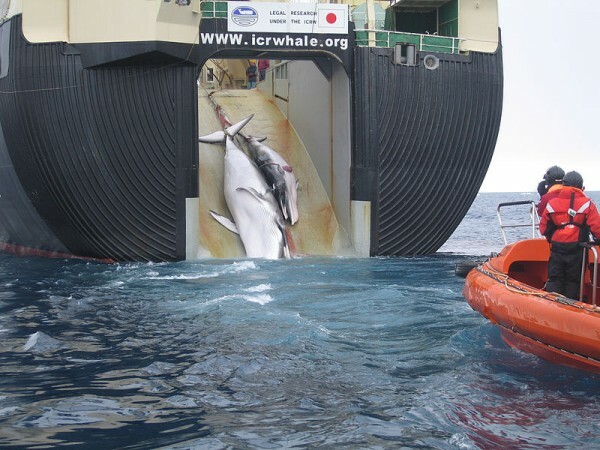 The ruling is a victory for Australia, which filed court proceedings against Japan’s whaling in 2010, arguing that it breached international obligations. Notice the real problem here: Not that Japan kills to eat whales. But that Japan claims that it kills for science! Notice the different criteria used: Killing for eating is not good. Killing for science is!!!! In the era of scientism, what is natural is condemned while what serves the new religion is hailed as “good”! Ecology is about balance. If one species eats another, does that constitute “unbalance”? I say let’s stop being hypocrites! I say stop killing in the name of science! I say let’s not save another whale in the name of any science! I say kill all the whales and eat them! In the name of us!